Just a little bit of snow to wet your pallet. More importantly, it will establish a base for the arctic air mass, and lock it in longer for the bigger storm. While temperatures will get near or above freezing, the cold air aloft will guarantee snow and a high ratio. Often we use a base of 10:1. That's 10 inches of snow for 1 inch of liquid. But when you factor in the temperature at cloud level- where the flakes will form...we can get higher ratios with colder temperatures. The overnight models have indicated an average of about -10C or 14F which allows a dryer more 'fluffy' snowflake. For reference, and with the next storm, this 850mb level which is around 5,000Ft up is what I use compared with surface temperatures as a basis for snow, or some form of ice. That is what I see here. I have bumped my total (Now NWS has as well) due to the type of snowflakes. This reminds me of the December 5th event. It was a similar push south with the final model runs, and that puts the clipper to our south. That usually results in slightly higher amounts of snow because the mountains will not steal the moisture. 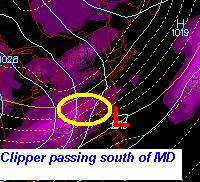 In fact a little upslope (winds flowing from the ocean up the hills) on the north side will enhance our little Low. The snow will reach it's peak this evening. I would place a general 4pm-10pm for our accumulating snow time frame. My general forecast: 1-2 inches of snow. However, watching the enhanced radar- it could easily bump up to the next category (2"-4")on my afternoon update. It's looking like a repeat of the December 5th storm. It may clear our to catch the back half of the total lunar eclipse tonight if we are lucky. Sorry I had to post something here for you to view to help the cause. I put one of these on my TV Graphics page, but it gets missed at the bottom. I have always hedged my best on the trend of the models. This morning, I see that trend with our clipper and with the main event Friday. Both the Canadian and GFS which I highlighted the other day are showing this. It has turned out to be a busy day for other reasons. This will not be fully in depth, but here's what I've got. Considering the GFS has the best placement of the clipper this morning, I will use it for positioning for Friday. The text output is supporting a change over to ice at least near I-95, as we warm in cloud level (850mb), but stay near or below freezing at the surface. A classic snow/ice line setting up somewhere close. Considering the behavior of today's event staying colder and farther south, I will leave that potential shift for Friday as well. So a forecast of snow to ice, may stay all snow in places. At this point, a good chance for well over 4 inches of snow where it does not change over. However, the ice problem will be bad. I already told a neighbor that she should telecommute on Friday and not drive in... I would put money on school closings, and extended coverage on local TV- Especially here at ABC. I promise I do more tomorrow.